Many trees - 1 Forest/ 天下武林是一家 | Small talks about Martial Arts, Life and more Martial Arts…………..
Purchase PDF files of old Kung Fu books and magazines …..click here. Also sadly, my partner’s (for the last 11 – 12 years) elder sister passed away after 2 -3 years of struggle with cancer; all that chemo, radiations, drugs both western and eastern….. I don’t know…..what I do know is that our prayers are with her to go to a better place…..
Then with our new training center seeing good response, we have about 15 new intakes since words got out, Por Suk’s visit to share his Ban Chung Wing Chun – all these took some nifty coordinating from my staff. Not forgetting that we got to squeeze in some R&R time for Por Suk to be a tourist since this is his first time in Sarawak. Even then, we spent most of the time talking about TCMA. I will talk more about this uncommon Hung Gar form and another “monkey cudgel” form that he does – forms that I remember vaguely reading about in some real old books and thought no longer practiced today…..
Once again proving how little I really know …. Oookay, this is becoming a regular – meetings, brainstorming, working with my “resident-writer”, interviewing folks for our upcoming book and to top it of, I have to get the school ready for Por Suk’s visit next month. Met up with one Dr. Lum, a demographer, and thru him, a clearer picture is emerging – the early days’ Chinese migration to these parts breakdown by dialect groups and their destinations all over Borneo. Dr. Lum has written a few books on this topic and serves as a consultant to many clan associations all over Sarawak….a bona fide authority in these matters. The interview session took me a step closer to understanding the heavy influx of Canton based art forms which is baffling seeing how Cantonese is a minor dialect group these days. Back then, Miri an “oil town”, was drawing many British and along with them came the Hong Kongers who were primarily working for the British. Then I have to discuss details of Por Suk’s forthcoming visit which will include a 2 days’ workshop we got planned to launch the new school site. There will be press releases, invitations and etc etc to look into … someone got to get everything coordinated ……we want Por Suk to really enjoy his stay. 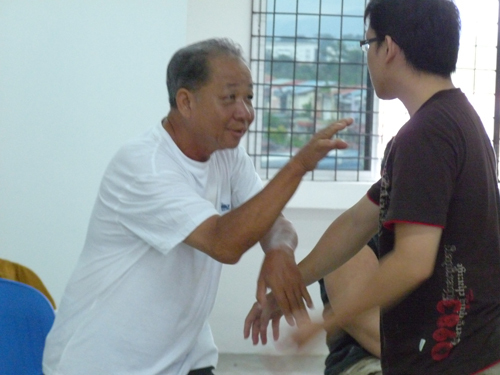 So there you go …..
Here’s one of Por Suk more recent clips taken from his blogsite :- his student doing Siu Nim Tau and you’ll find more at his youtube channel….. Okay, it is finally happening – no, not Spain lifting the world cup but me starting a school proper here in Kuching Sarawak…..
After much egging from my boss, we went out to scout for some space and found one that meets our requirements – all 1500 sq feet…..
Not that I am unwilling to teach, you understand but it just that teaching is such a major commitment and I needed to be certain that my schedule allows for this – half baked bread is lousy bread! 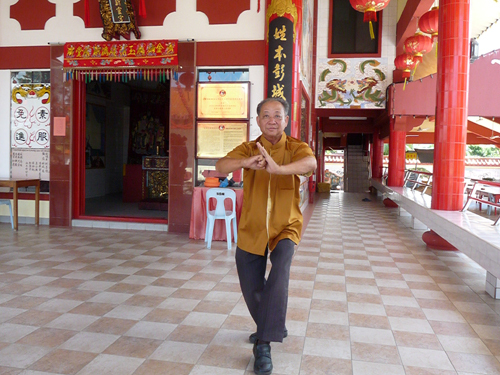 So anyway, the school will be operational real soon and guess what – I have invited Cho Gar Wing Chun Por Suk and some local masters to grace our “opening ceremony”; Por Suk has also kindly agreed to spend a couple of days to conduct a Wing Chun workshop at our new premises – a first for Kuching…….. So there you go …. Got another mainland clip here to share – “Black Tiger Fist” – this must be my 2nd or 3rd northern (ShanTung) Black Tiger clip on youtube. Just google and you will call up many forum sites with all sorts of arguments presented. Well like I said many times before, there are plenty of CKF histories and lineages recorded that were passed down in the last few hundred years. The thing is these are generally manuscripts written in old-hand mandarin and not published for public consumption. 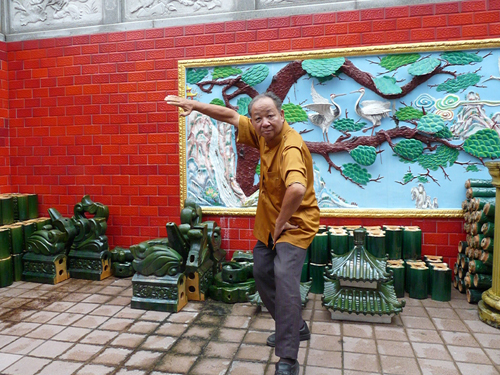 And with many “experts” – if they did not read it in English or see it in a kung fu movie – the style does not exist. Back from “On the Road Again”. Perhaps folks around here are right, the ball is round and you’ll never how it would spin for sure ….. But but but still, Brazil and Argentina no semi- final dates – I want my Samba Football!!! Diego Maradona – WHAT HAPPENED ??? Rector of Aswara – The National Academy of Arts, Culture and Heritage. And the follow-up after these meetings is tremendous if we are to move our projects forward expeditiously. Maybe it is just me but Kuala Lumpur, this time round, seems quieter – more pensive in a way. 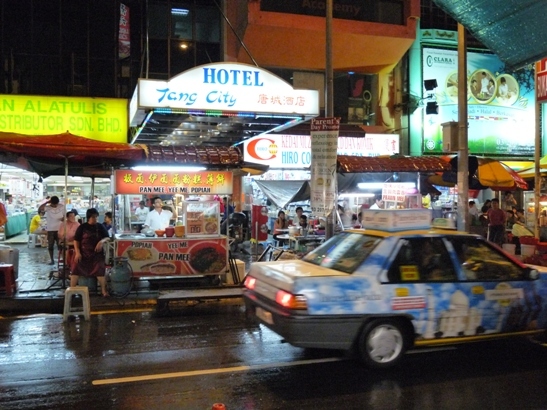 I stayed where I normally stay when I visit and this is the heart of Petaling Street or China Town to most tourists. The usual open air market is still as vibrant as before but somehow the mood in the air is different – I don’t know, it could be the football season. Everywhere I go especially cafes and foot courts, big screens TV are inevitably present. 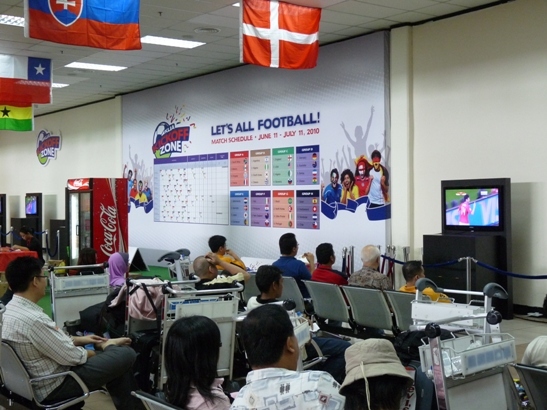 Even at the airport waiting area, a row of TVs were set up for waiting passengers to stay up to speed … football crazy country I tell you !!! Then I was up early one morning and walking to a coffee shop for my breakfast and I happened to look up and guess what I saw? A new (never noticed this before) or renamed hotel called “5 Elements” ….. now this is interesting. 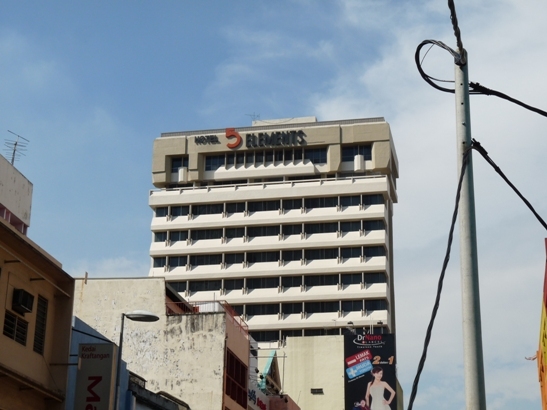 Tang City Hotel – This is where I normally bunk out when I am in KL. 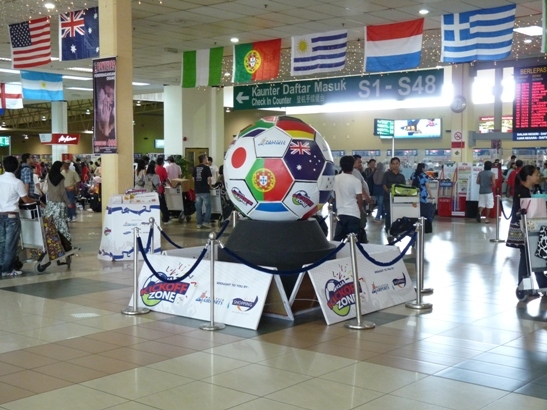 What did I tell you – football crazy country !!! 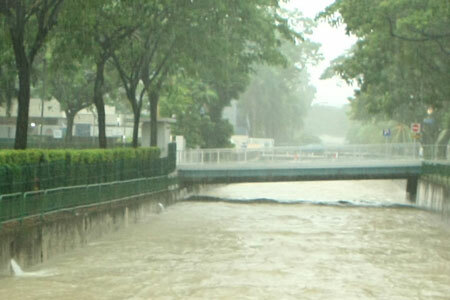 Heavy flooding in parts of Singapore….click here. Aha, found a clip that illustrates what I was trying to say about “whipping & splashing” jin execution – signature features of orthodox Fuzhou Cranes…..
White Crane elders are constantly reminding me – “No whipping no White Crane”…..
Love the way how some Taiwanese lines are keeping things so close to the core of classical Crane Boxing according to handed down manuscripts – the ones that are taking me forever to convert……..
Hey hey, it is from Fuzhou to English ….and the Fuzhou portion is already killing me!